John Warner (W), Bruce Jones (W), George Kashdan (W), Gene Fawcette (P/I), Al Williamson (P/I), Carlos Garz�n (P), Al McWilliams (P/I), Frank Bolle (P), and Rick Veitch (C) Flash Gordon-hero of Mongo, gentleman scientist, two-fisted fighter, and now savior of the universe! Join Flash, the lovely Dale Arden, and Dr. Zarkov as they make a last desperate stand against alien monsters, corrupt kings, ravenous sharks, and the ultimate supervillain, Ming the Merciless! 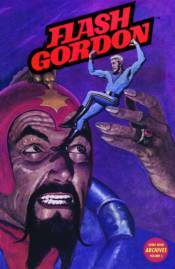 This volume collects Flash Gordon #28-#37, plus the three-issue adaptation of the cult favorite Flash Gordon movie!